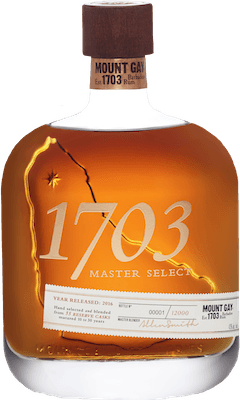 Have you found an online vendor selling Mount Gay 1703 Master Select? 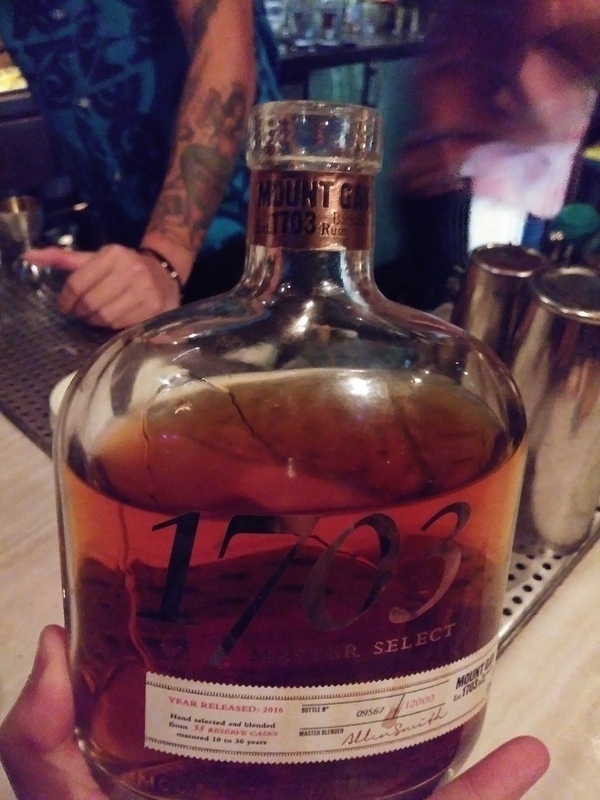 I like mount gay rums, and I love the 1703 Old Cask. I drink the XO regularly, but this "Master Select". is disappointing. I have a bottle of the 2017 batch and its dry and confusing. For a premium rum, I have found it difficult to appreciate this bottle for what it is, as it is overshadowed by what it needs to be. alcohol on the nose, too complex to the point where it leaves you wondering and then finishes you with a dry mouth. I sip Old Cask and while I can sip this? why would I? the experience is on par with XO, which is a fraction of the price of this bottle. It mixes terribly with coke. While I would never mix a premium, they rarely take away from a rum and coke...this one does. Enough said. Disappointed. Did a Masterclass with Mount Gay ambassador, Mr Chester Browne, who was really fabulous and a great man. Had this one as the last one in the tasting, and I don't know if it was because Mr Browne was so enthusiast about this and I felt his emotions through his words but this one has some real layers. First you can feel apricot right after that vanilla, but it is subtle, it doesn't bother you (I'm not a vanilla fan), then it comes to you freshly baked pastry, and then the wood. It's really round in the mouth, complex, no burn at all, and a very long finish, I wish it never ended. Truly an experience to be done at least once. Not an everyday rum, just for special occasions. After this one I didn't had any other rum that day, it was the perfect ending. I always wonder when you purchase something that has the same description as a similar rum from the same maker; if it is just a marketing ploy to get you to purchase something you already own. All be it, in a different bottle and packaging. I have gone down this road before with Bacardi Gran Reserva Limitada and Bacardi Reserva Limitada. That being said, there is a difference between the Master Select and the Old Cask Selection but unfortunately it is not for the better. The Master Select seems to have a little more bite and a lot more oak. I hope this is not the future of rum where they just market the same rum to you with minor tweaks and adjustments. I believe this is replacing the Mt Gay Old Cask, and is quite a bit pricier ($150 vs $100), so the question I have (and probably others have too) is which one is better, or are they the same? It is very close. These are both very, very similar, but I think maybe I could tell them apart as this one was ever so slightly sweeter (but just barely). Otherwise, they are both about the same to me. The Master Select Rum is a rum blend which features aged pot and column still rum stocks from aged barrels. These barrels have an age range of 10 to 30 years. 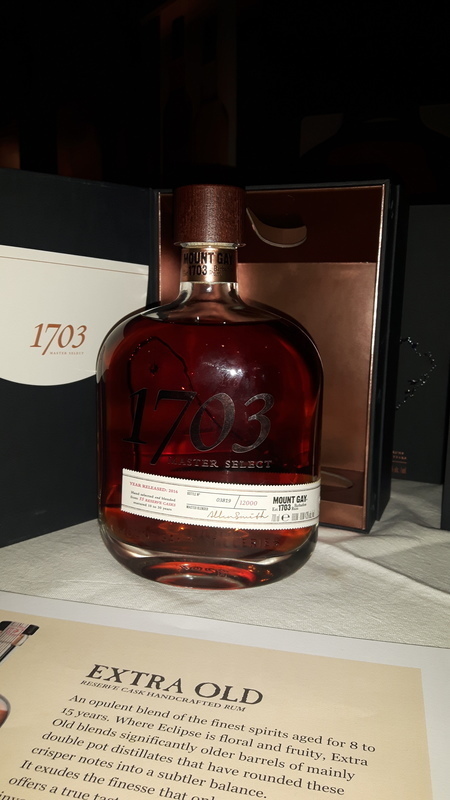 The master blender, Allen Smith personally selected the 55 barrels (Chosen between casks 8583 and 12921) used within the 1703 Master Select blend. With a beautiful amber color, the nose releases notes of citrus fruits such as orange with notes of coffee, chocolate and coconut. Very complex. On the palate, there are notes of coffee and chocolate, it is very soft on the palate. The woody side comes at the end of the mouth but it is drier and more structured than the Old Cask version. The finish is beautiful, long and complex and woody. The price is high compared to the other version but it allows, if you want to compare them, to understand the essential role of the master blender. 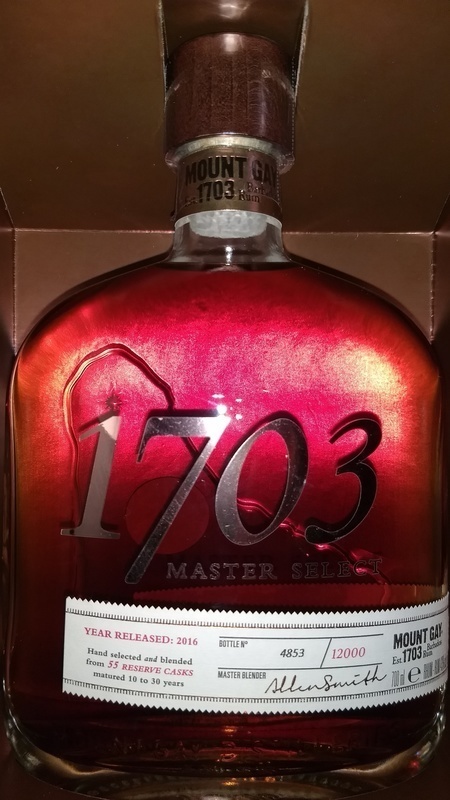 The 1703 Master Select has a similar taste profile as the 1703 Old Cask. Nice blend of 10 to 30 year old rums with no sweetness factor. At 43% you can detect the alcohol aroma and a bit more burn than standard 40% abv rums. The good news in the flavour profile aspect is that the oak, vanilla, caramel, and some spice (nutmeg comes to mind) are all present and well balanced in this blend. Like the Old Cask version this one has an initial strong alcohol taste, that moves through the flavour profile and then fades to a nice long afterburn. It's a strong rum that for some drinkers it might require a piece of ice, but for a whiskey drinker it will be just fine. It's a bit pricey and needs to be smoother and more complex to rate any higher than an 8. I have a definite soft spot for this one, a little sentimentality creeping in perhaps. I first tasted it at the Mount Gay visitor's centre on Barbados about a year ago, on the first day of an awesome 2-week holiday. Whilst most of the other people on the same tour were tasting cocktails from the bar, I sat outside and rolled a shot of this around the glass for a few minutes then took a sip. This is a rum which will impress you from the very first sniff, let alone sip. The nose has everything that you ever thought rum should smell like, before you were old enough to taste it properly. It does have a little more alcohol heat than I feel it ought to, but that dies away quickly leaving a wonderful caramel and citrus cocktail on the tongue which lingers into a long finish. I just spotted another review mentioning butterscotch ... "Yes!" I agree. Oaky? ... not so much. Certainly not as much as any of the Appletons I have tried. I feel I want to rate this rum higher than an 8, but for £120 per bottle that is hard to justify, especially when one considers just how good the XO and the Black Barrel are, for less than half the price. Enjoyed 2 glasses of Mount Gay 1703 Master Select with my friend during a 5,000 mile road trip across 18 States. Bottle and label design look high end. Dark mahogany color. Strong oak straight to your nose and palate. Quite strong and dry burn at the end. For whisky lovers, add 2 points. Not my cup of tea. Rum started in Barbados.......this rum proves it. Its perfectly balaneced and great neat or on a spherical ice cube. I purchased a bottle of this while in Barbados. I admit, I was a bit lured in by the attractive presentation and near-perfect color, but felt slightly let down by the flavor. Don't get me wrong, the flavor was excellent but it was not "exceptional" as the look of it would have had me believe. Typical high end run nose. Buttery, smooth sweetness with caramel and toffee notes. Enjoyed it. The successor to the 1703 old cask. Master select (2017 version) does a lot of things well, but is not spectacular or as broadly appealing as the old cask was. The nose is really inviting with butterscotch, nailpolish, banana, cut grass, woody sawdust and tobacco. It promises great things, but the taste cant quite keep the same pace. In the mouth I pick a fairly oaky and dry profile with notes of very dark chocolate, robust pipe tobacco and oily leather. It coats the tounge with a longlasting, warming finish. It’s good but quite heavy on the oaky notes. To be enjoyed in the sun under an umbrella with lots of sand about. pour over ice and enjoy the view. Mangler lidt sødme. alkoholen brænder lidt for meget igennem. If price is not a concern, then this is a rum to have. Delicious, not too heavy on the spices, aromatic, and with a great finish. I recommend against mixing this rum, as it's best enjoyed straight or (if you must) on the rocks. Eclipse, Silver, and Eclipse Black are better choices for mixing from Mount Gay. Finally got a bottle of this rum, $130 US, and had a few drams. Very easy to sip and it offers great flavors and aromas but there are many rums at 1/2 the price that offer equal or better flavors and aroma. I am not sad I got the bottle, I will enjoy every dram but I don't think I will be rushing out to get another. Van de oudste rum distilleerderij ter wereld, gelegen op Barbados komt deze blend van 55 vaten pot en column stil rums van tussen de 10 en 30 jaar oud. Gelimiteerd tot 12.000 stuks en komt in een fraaie verpakking en dito decanter. Droog en bitter met smaken van karamel, eiken, bourbon, vanilla, zoethout en iets maritiems (zoutig) blijft hangen, lekker hoor. Helaas maar 43%, had wel cask-strength mogen zijn voor deze prijs. Wel een aanrader, maar ik zou met de XO ook wel genoegen kunnen nemen. Mount gay gets alot of hate. 8.2 average for this piece of art!? Insane. This is a superiòr rum, that is true to the name of rum in every way. Smooth, dark, complex, full bodied, sweet , velvety creamy smooth. Delicious!!! Takový velmi drsný rum. Je vidět že je dělán poctivě. Chutná mi. Alcohol on the nose. Slight vanilla flavor. A lot of alcohol comes through and not a smooth as I expected.